The Royal Palm Yacht & Country Club in Boca Raton is one of South Florida's premier private clubs. Royal American Carpets was more than thrilled to work with and provide our products & services for this prestigious club. 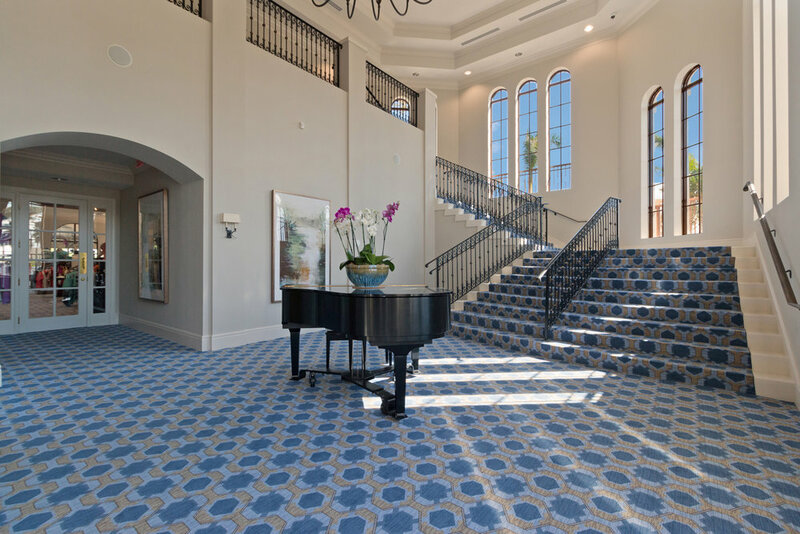 Our custom-designed Axminster carpet arrived within the accurate lead time as promised, and thanks to a professional, successful installation, the Carpet looks stunning! It's always an awesome privilege to get any opportunity in hospitality design and present our particular services. Whether it's one custom area rug or many corridors of a hotel - our team is always grateful and excited to get to work. Still when it comes to servicing Country Clubs, the process seems to be more captivating to us. There's nothing quite like the elegant and luxurious atmospheres, combined with extensive areas. And this is precisely what we're equipped for! Country Clubs allow us to take full advantage of our talented design staff coupled with our state-of-the-art-machinery. Now add that to our aggressive, accurate lead times and it's the perfect combination. Axminster Carpet machinery can produce intricate designs and up to 16 total colors. Country Clubs, Golf Clubs or Yacht Clubs typically contain numerous areas requiring different ambiences. Our Axminster machinery can produce an unlimited amount of designs within one color scheme. Therefore, we can produce custom patterns for each and every area within a Country Club, if that's what is desired. This is also extremely beneficial because all of the additional carpet patterns do not increase the budget. Pricing only increases if multiple color ways are required. One major factor with this type of carpet construction, aside from all of the design and color benefits, is its durability. Axminster construction is the cream of the crop for Country Clubs and the heavy foot traffic received on a daily basis. Please visit our Axminster product age to learn more and read why it's the preferred high-traffic carpet, and known to last longer than any other type of construction. Below is information about each of the furnished areas at the Royal Palm Yacht & Country Club, as well as the specifications of this Axminster Carpet. For additional information and the scope of work on this Private Club, please visit our feature project page, which contains more photos and links to similar completed projects.